Chopsticks are used not only in Japan, but in other countries as well. I guess each country has its own manners and etiquette for handling chopsticks. Today, I would like to focus on the proper way to hold chopsticks, as well as maneuvers prohibited by Japanese chopstick etiquette. Learning chopstick etiquette enhances the enjoyment of Japanese food. 1) Place one chopstick inside of thumb and reach to the ring finger. 2) Place the other chopstick between the index finger and middle finger and hold by pressing with your thumb. 3) Freely move chopsticks by pressing thumb and only moving your index and middle fingers. 1) Awase-bashi: Don’t pass the food from chopsticks to chopsticks. 2) Hotoke-bashi: Don’t stand your chopsticks up in rice. 3) Kuwae-bashi: Don’t hold chopsticks between your teeth. 4) Tataki-bashi: Don’t drum your chopsticks. 5) Kara-bashi: Don’t touch food you don’t intend to eat. 6) Sashi-bashi: Don’t use chopsticks to point. 7) Mochi-bashi: Don’t move a bowl to the same hand that holds chopsticks. 8 ) Mayoi-bashi: Don’t hover your chopsticks over food when deciding what to eat. 9) Yose-bashi: Don’t use your chopsticks to move a plate or bowl. 10) Nigkri-bashi: Don’t grab your chopsticks with the fist. 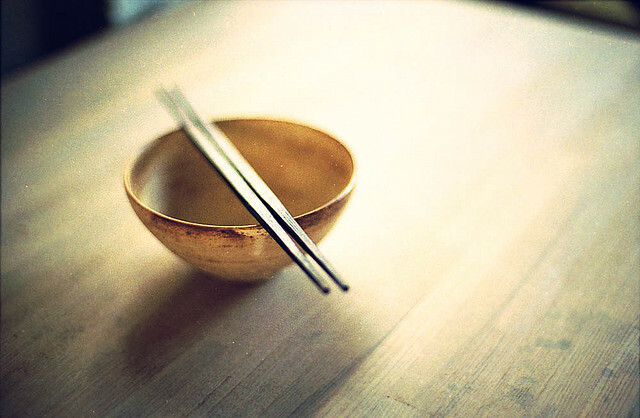 11) Watashi-bashi: Don’t rest your chopsticks on your plate or bowl when you are not eating. 12) Seseri-bashi: Don’t use your chopsticks as toothpicks. 13) Hanairi-bashi: Don’t stick chopsticks up in your nose. 14) Mimiiri-bashi: Don’t stick chopsticks in your ears.